Finally, a boldly colored merman tail for little boys! 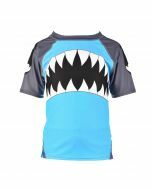 Fin Fun’s toddler merman tail in Sid’s Barracuda Black is just right for the boys who want a “manly” color to wear while playing with the other mermaids! Featuring a realistic scale design in speckled hues of gray and black, this soft fabric tail is perfect for splashing or playing. Why should girls have all the fun? This black-hued merman/mermaid tail for little tykes is just what your son needs to take playtime to the next level. 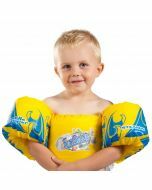 He’ll feel like undersea royalty in or out of the water wearing this toddler tail from Fin Fun! 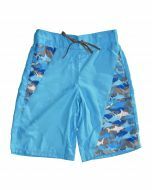 He can even match brother or sister in our larger-sized swimmable mermaid tail for kids and adults. Your toddler will love the way his merman tail looks in the water! 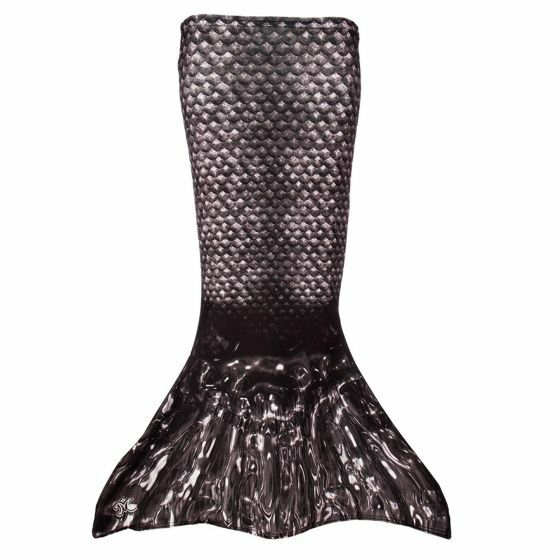 As part of our Mermaidens collection, Sid’s Barracuda Black merman tail is the closest thing to an iron-clad look you’ll get. He can show off his tough side at the pool prowling the waters with his merman tail and shark fin, too. Toddler tails have a fully open bottom, like a long skirt, to allow free leg movement. They do not use monofins like swimmable mermaid tails. Our toddler mermaid tails reach just above the feet so little ones can safely walk without getting tangled up. Plus, the fabric is loose enough for kids to kick their feet as they learn to swim.